Getting kids to wash their hands can be a task in itself, but it can be even more difficult if they can't reach or turn the faucet handles on the sink. By using some everyday tools and items, you can make this process much easier for your child, without sacrificing the decor in the room. Measure the diameter of the faucet handle. 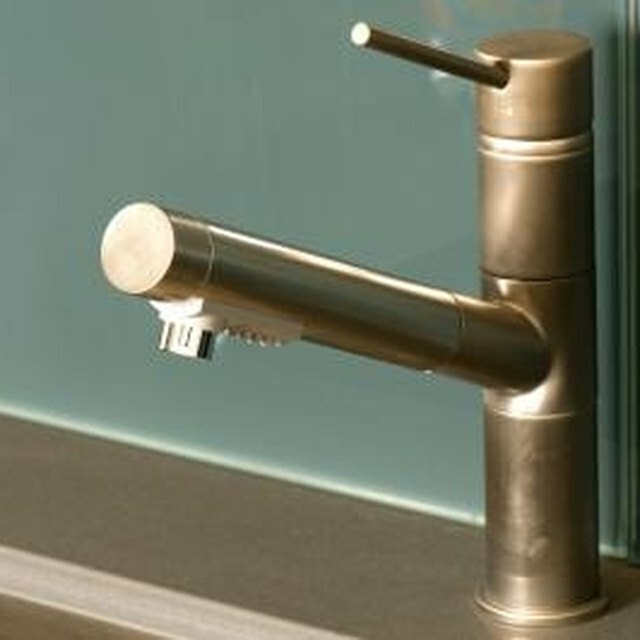 If you have the lever type of handles, measure the diameter of the thickest part of the faucet handle. If you have standard knob handles, measure the entire diameter of each knob. Find two pieces of plastic tubing in the diameter of each faucet handle. You can typically find various diameters of plastic tubing at a local hardware store, often in white, black, gray or even clear. Cut the plastic tubing with a hand saw so each piece is about 2 to 3 inches longer or higher than the current handles. Slide each piece of plastic tubing over the handle. The fit should be snug and allow the knob to be turned easily. If it is too loose, it may easily fall off. Clean the extension regularly. Soap and water can often get stuck in the tubing when children wash their hands, which can lead to a buildup of mold or mildew. Be sure to slide them off when you clean your bathroom regularly to clean the area. If the tubing you put on is slippery, purchase the small no-slip pads that often go on the bottom of chairs or furniture. Peel off the sticky back on one side and stick them at various places around the tubing. This will give your child extra gripping when turning the knobs.